I have been fascinated by Dinosaurs for as long as I can remember though you may have guessed that already from my Gravatar profile picture. I think everyone at some point in their lives is obsessed with Dinosaurs. It can just be as a child who loves playing with Dinosaur toys or perhaps your love for them can stay with you for your entire life as in my case, but I think everyone at some point, for a short while at least has been drawn into the magnificent lost world of these prehistoric beasts. I have wanted to write about Dinosaurs for quite some time now, but for some reason I have never managed to get around to it yet. Now however I am going to devote a whole series of articles to them called Dinosaur Spotlight. This series will see me look at one Dinosaur species in great detail. 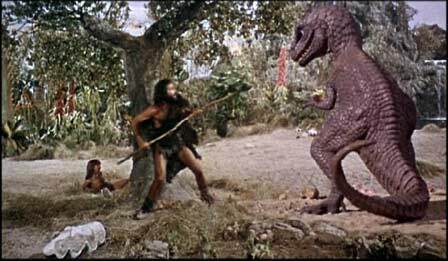 I will look at how the Dinosaur lived, its role in popular culture, such as its history in film and television and other forms of media, and also deconstruct some of the most famous myths about the animal. Now the first Dinosaur I will be looking at in this series is Tyrannosaurus Rex. Tyrannosaurus is by far an away my favourite Dinosaur. I know that is a very unoriginal thing to say. Tyrannosaurus is like the Dinosaur version of a rock star, it is by far and away the most famous Dinosaur of all time, everybody loves T. Rex. Still the reason for that is because it is just such a spectacular creature. It is the ultimate killer, a monster whose relentlessness and savagery is utterly unmatched in the animal kingdom. Even its name which means the “Tyrant Lizard King” is as Bob Bakker put it “irresistible to the tongue”. In this article we will be giving you a few basic facts about Tyrannosaurus Rex that you need to know before we move on to exploring its role in popular culture, the main myths surrounding the tyrant lizard king and its devastating power in later articles. Tyrannosaurus Rex lived in North America 65 million years ago during the Cretaceous period. It was one of the last Dinosaurs to go extinct. It lived alongside other famous Dinosaurs such as Triceratops, Ankylosaurus as well as numerous Dromeosaurs and even giant Sauropod, (long necked, planet eating) Dinosaurs such as Alamosaurus. Though they are often depicted as enemies in popular culture T. Rex never lived alongside other more famous long necked Dinosaurs such as Diplodocus or Brachiosaurus or for that matter the famous plated Dinosaur, Stegosaurus. There is more distance between you and Tyrannosaurus Rex than there is between Tyrannosaurus Rex and Stegosaurus. Tyrannosaurus Rex was the undisputed king of its world. It had no rivals and would have preyed primarily on the large Duckbill Dinosaurs, the Hadrosaurs. However it most likely would have preyed upon any large herbivore it could catch and fossil evidence shows that it did hunt the likes of Triceratops, as numerous Tyrannosaur bite marks have been found on Triceratops bones. Tyrannosaurus belonged to a group of Dinosaurs known as the Tyrannosaurs. The Tyrannosaurs originally began as small meat eating Dinosaurs during the Jurassic era. They gradually throughout the Cretaceous period evolved to become larger and eventually usurped other large meat eating Dinosaurs, driving many of them to extinction by out competing them. By the end of the Cretaceous period the Tyrannosaurs had become the dominant and largest meat eating Dinosaurs in any areas they occupied. 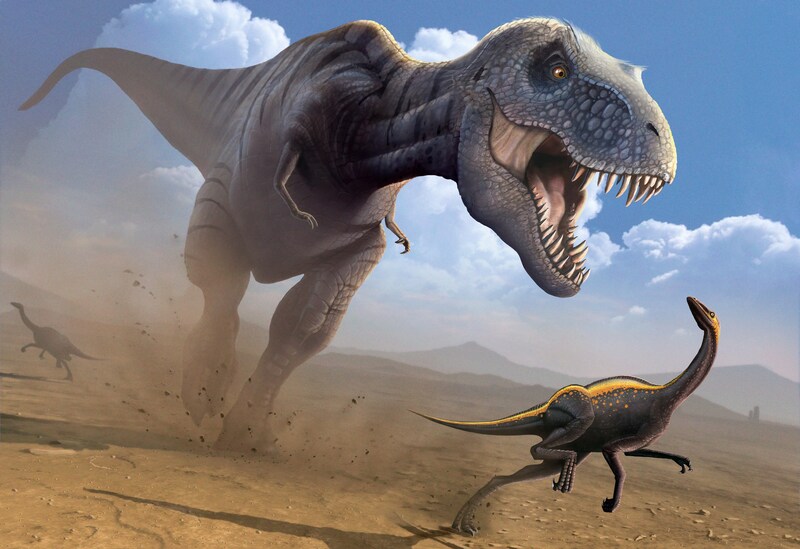 Among the other members of the Tyrannosaurs family included Tarbosaurus (Tyrannosaurus Baatar), Albertosaurus, Daspletosaurus, Nannotyrannus, and Gorgosaurus. The Tyrannosaurs were more closely related to smaller meat eating Dinosaurs such as the Dromeosaurs (which included the famous Velociraptor). They had nothing in common with other larger meat eating Dinosaurs such as Allosaurus or Giganotsaurus, despite superficially having a similar body plan of a large head and small arms. The Tyrannosaurs were actually much more closely related to modern day birds than to other large meat eating Dinosaurs as they evolved from the same ancestors as the birds. DNA extracted from a Tyrannosaurus skeleton showed its DNA to be similar to Osterichs and Chickens. It is also believed that early small Tyrannosaurs even had feathers, though there is currently no evidence that any larger Tyrannosaurs would have been covered in feathers, which actually could have proved problematic for such a larger creature being covered in insulation as it may have caused it to become over heated. Still despite this it is known that the brains of Tyrannosaurs, including T. Rex were far more similar to modern day Alligators. Tyrannosaurus’s brain was almost identical to an Alligator in fact and therefore in terms of behaviour if we can compare the Tyrannosaurus to any animal alive today then it would be to an Alligator rather than to any avian. Crocodillians like Alligators and modern Crocodiles are not Dinosaurs, but they are related to them as they belong to the same group of reptiles the Archosaurs. It is not known why the Tyrannosaurs unlike their relatives such as the Dromesosaurs and the Birds grew to be so massive but whatever the reason they went over the course of several million years from tiny bird like creatures to massive behemoths who were the undisputed apex predators of their environments. Tyrannosaurus Rex however was by far and away the largest of all the Tyrannosaurs. It was over 40 feet long, 24 feet tall at the shoulder and could reach a maximum weight of 9 tones. It was longer, taller, and heavier than any land animal alive today. It was believed for almost 100 years to have been the largest meat eating Dinosaur and the largest land based predator ever to have lived on the planet. Now however we know that there were 3 meat eating Dinosaurs Spinosaurus, Giganotosaurus and Carcharodontosaurus that were all larger than T Rex. All of these Dinosaurs lived at different times to T. Rex and thus would have never met it in real life. Tyrannosaurus may have looked after its young. Evidence for this comes from an adult Tyrannosaurus found near the body of an infant, but whether they lived together or simply died together is not known for sure. Tyrannosaurus Rex was first discovered in the year 1902 by Barnum Brown who was nicknamed “Mr Bones” because he had discovered so many Dinosaur bones. It was originally named Dynamosaurus Imperiosus by Henry Fairfield Osborn. Dynamosaurus Imperiosus means “Powerful, mighty lizard”. Fortunately even though Dynamosaurus is quite a good name too the beasts name would still later be changed by Osborn to Tyrannosaurus Rex, “The Tyrant Lizard King” which is subsequently the only full Dinosaur name known to the general public. Triceratops’s full name for instance is actually Triceratops Horridus, but most people only know its first name. Osborn declared that Tyrannosaurus was the supreme fighter in the animal kingdom. In the following articles we will see how Osborn was 100 percent correct in his assessment of the rightfully named King of the Dinosaurs. 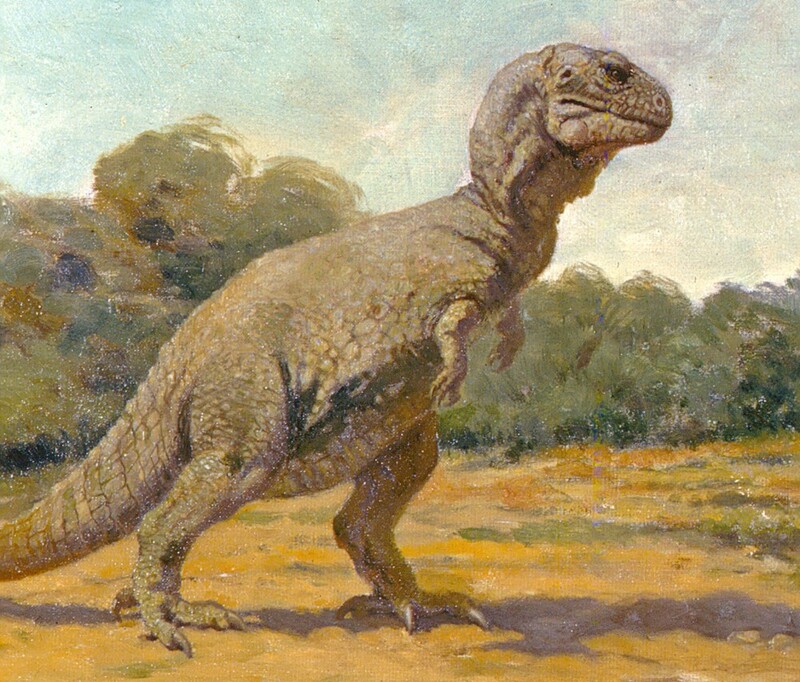 Originally it was believed that Tyrannosaurus stood upright like a tripod as this wonderful painting below from Charles R Knight depicts. After the link between Dinosaurs and birds was firmly established however, subsequent depictions of Tyrannosaurus Rex generally tend to show it in a more bird like stance. Next up a look at the devastating power of Tyrannosaurus Rex. I was very much obsessed with dinosaurs in my primary school years and continue to be slightly obsessed to this day, so I’ll look forward to reading more of these from you! Tyrannosaurus really does capture the imagination even compared to other dinosaurs. We just have nothing today that compares: the largest land carnivore today is the polar bear, and this terrifying monster weighed as much as 15 polar bears! It may have been beaten as the biggest carnivorous dinosaur in recent years, but it’s had much more time to embed itself in popular culture, and I suppose the name Tyrannosaurus Rex sounds more badass than, say, Giganotosaurus. 5 jussic park film kom uit in juni 2018 in de cinema zalen in belgie….